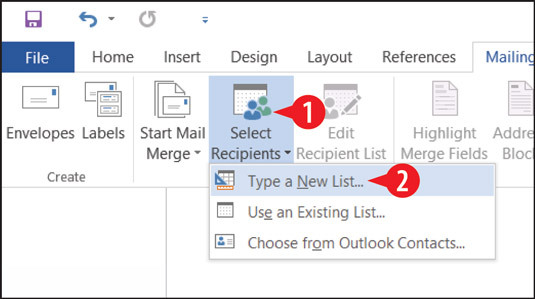 With the main document open, on the Mailings tab, click Select Recipients. Click Type a New List. Choose to type a new list. 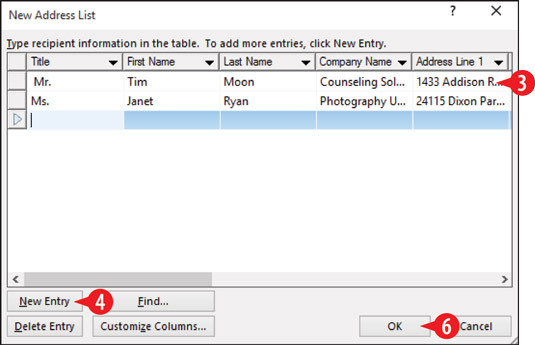 Type the name and address, pressing Tab to move to the next fields (column). You don’t have to fill in all the fields for every person; just do the ones that pertain to the merge you are going to perform, such as name and mailing address. Click New Entry and then type another person’s information on the next row. Repeat step 3 until all the records are entered. Click OK. The Save Address List dialog box opens. Choose to type a new entry. Type a name for the list in the File name box. Navigate to a different save location if desired. The default location is My Data Sources in your personal Documents folder. Specify a data file name and location. If you later need to edit that file, choose Mailings→Edit Recipient List. 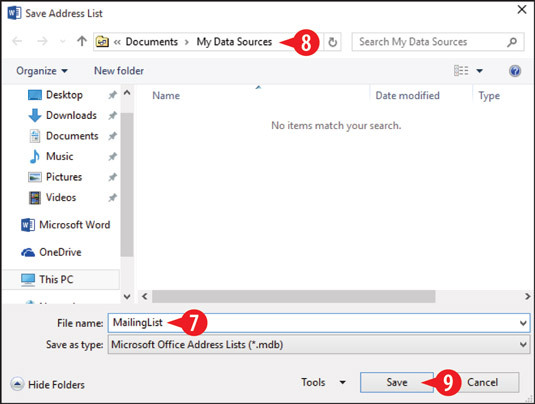 The saved file is in Microsoft Access database format, so you can also open and edit it with Microsoft Access.